Vitamin E is a naturally occurring fat-soluble vitamin. Its antioxidant properties have made it a popular candidate to combat oxidative stress and diseases that are caused by it. It has been widely studied as a potential treatment for both primary and secondary protection of cardiovascular disease because of its well-understood mechanism, its ability to naturally recycle itself, and its promising epidemiological evidence. After numerous prospective and retrospective clinical studies, there has been a lack of consistent evidence supporting the notion that vitamin E should be used for the primary and secondary prevention of cardiovascular disease (CVD). 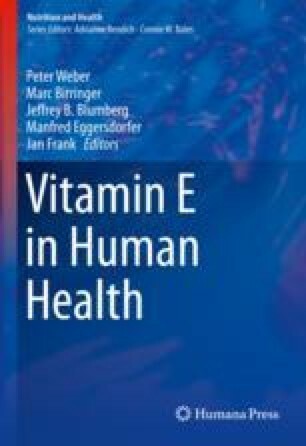 This chapter outlines various clinical trials that have assessed the potential clinical benefit of vitamin E to prevent CVD. Joshua Wiener and Elliot Berinstein contributed equally to this chapter.